ATTAP HOUSE is a restaurant located in the new wing of Fusionopolis (Galaxis). Dining is no longer about the food, but the experience as well. The concept here is a nostalgic one - with heavy rattan chairs and wooden decorations filling up the restaurant. The 80-seater with both indoor and alfresco seating area offers an eclectic menu serving a wide range of Asian inspired food and beverages. 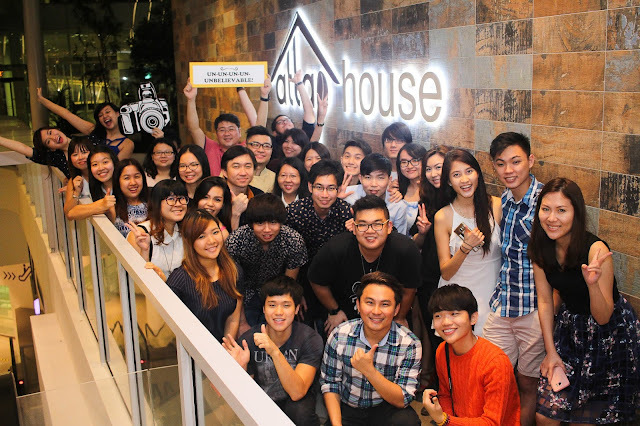 Edmund Koh shared, “We believe with ATTAP HOUSE we are creating something new to bring to the table for our diners. So in coming up with the design concept, we were cognisant of the overall philosophy to present this unique café with themes from yesteryears– and, more importantly, a balance of Asian and local influences must be achieved". Their peanut butter jam is made in-house with cashew added into it. They use more caramelise sugar in their kaya to give that uniquely sweet fragrance. ATTAP HOUSE also boasts a range of side dishes like Assam Fish, Otah Otah, Sambal Kang Kong and even Tahu Goreng. While the noodles are quite dry (it somehow didn't soak up the peanut sauce), the prawns are really fresh! However, I found it strange that there is a cut on the prawn vein, but the dark digestive tract is not removed. This is my favourite and highly recommended! It was surprisingly crunchy and fragrant, the texture and flavours all come together really nicely. In fact, the table I was sitting at called for another plate! The grilled pork chop was pretty sweet, and it had really thick skin. It was also quite difficult to take photos because it is black (I thought it would have a slight redness like char siew). With 16 years of international experience, executive Chef Mr Marco Ong oversees the food preparation and cooking process. Cauldron, cauldron boil and bubble! Bobo cha cha is supposedly a colourful dessert, and visually this wasn't. However, it was more flavourful than the usual ones I've eaten at dessert shops. This was rich in sweetness, with the sweet potato and gingko nut adding an extra kick! I'd highly recommend this for your noontime dessert, really. Delivery is also available. Customers can call 90522669 to make an order from 9am-11am and 2pm-7pm only. Delivery fees are waived if the order is above $30. #01-04 Fusionopolis Galaxis, 1 Fusionopolis Pl, Singapore 138522.